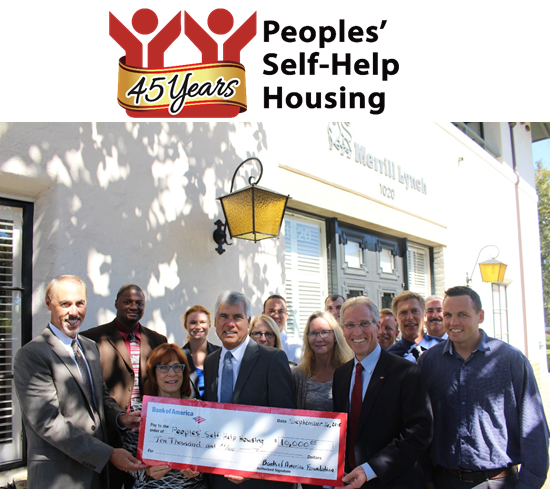 Central Coast, Dec. 21, 2015 – Bank of America recently presented Peoples’ Self-Help Housing (PSHH) with a $10,000 check in recognition of the award winning nonprofit’s 45th Anniversary in 2015. Founded in San Luis Obispo in 1970, Peoples’ Self-Help Housing has expanded to Santa Barbara and Ventura counties, with nearly 1,200 self-help homes completed and over 1,600 rental units developed. PSHH continues to strive to fulfill its mission to provide affordable housing and programs leading to self-sufficiency for low-income families, seniors, veterans, and other special needs groups. “Donations like this have helped Peoples’ grow and continue building quality affordable housing for hard working families as the demand for affordable housing has increased throughout the Tri-Counties,” said PSHH CEO/President John Fowler. Founded in 1970, PSHH is an award winning non-profit organization that develops affordable housing and community facilities for low-income households and homeownership opportunities for working families and special needs populations, such as seniors, veterans, the disabled, and the formerly homeless. With nearly 1,200 self-help homes completed and more than 1,600 rental units developed, PSHH is the largest affordable housing developer on the Central Coast, with offices in Santa Barbara and San Luis Obispo. For more information on Peoples’ Self-Help Housing, visit www.pshhc.org, email info@pshhc.org or phone (805) 781-3088.